Alfred Morang’s life ended with a fire. That’s where the story of our upcoming exhibition begins. It was a frigid January evening in 1958, and Morang was up late at Claude’s Tavern. The saloon was on Canyon Road’s 600 block, just down the street from Matthews Gallery. Its owner Claude was a burly woman known for ejecting unruly patrons by slinging them over her shoulder. She presided over a wild scene: legend has it someone once rode a horse straight through the bar. This was a fitting final evening for Morang. Claude’s was one of his favorite haunts, a place that still captured the dwindling spirit of his legendary house parties of the 1930’s and 40’s. Back then, he and his wife Dorothy were the toast of the Santa Fe art colony. Morang was a revered painter, art teacher, art critic and radio personality. His impressionistic paintings of colorful soirées filled with dancing ‘Ladies of the Evening’ and skeletal gentlemen had earned him the nickname ‘Santa Fe’s Toulouse’. Morang’s studio apartment was directly behind Claude’s, and he returned there around midnight. It was a tiny space so packed with canvases that you could barely navigate it. Sometimes the heating broke, and when it snowed Morang would haphazardly pin a muslin cloth over the open skylight. I was in the neighborhood bar the night his house caught fire. An old army buddy from Chicago had come to town and wanted to down cognac while viewing local color. There wasn’t much to view. It was a bitterly cold night, the streets deserted, the bar almost empty and quite cheerless. My bachelor friend dredged up memories of a thousand other cafes in France and Germany while my thoughts strayed to demands at home. Three weary women at the other end of the long bar seemed to be nowhere waiting for nothing. The sound of sirens startled us all. Fire engines skidded past the door, we could hear them screeching to a halt in a compound behind the bar. I knew Alfred’s small adobe casita was there. Nothing could be done. The roof had already crashed in and flames leaped high in the sky. I was thinking how very, very strange it was to be standing beside this war comrade watching helplessly, just as we’d done in Europe, as property and life were devoured by fire. And even stranger—later—when stretcher carriers fled the still-blazing ruin and rested their burden on the frozen ground. For firelight, like streaks of red and yellow pigment, crawled erratically over the sad tableau. And looking up from the bearded profile on the stretcher, I saw the women from the bar had joined us. Harsh, bright colors spiraled over their tawdry dress and hennaed hair, highlighting them against the black night. They were exactly like his painting […] his Ladies of the Evening. Meanwhile, the City of Santa Fe was having a hard time finding Morang’s heirs. He and Dorothy had divorced in 1950, and he wasn’t close to any of his relatives. Morang’s ashes sat in a closet in the New Mexico Museum of Art for two years before they were scattered over Canyon Road. Eventually, Dorothy helped locate a distant family member to send a box of Morang’s possessions that had been plucked from the ashes of the deadly fire. Decades after Morang’s death, local art scholar Paul Parker conducted a national search for that box, which had passed down through the Morang family. 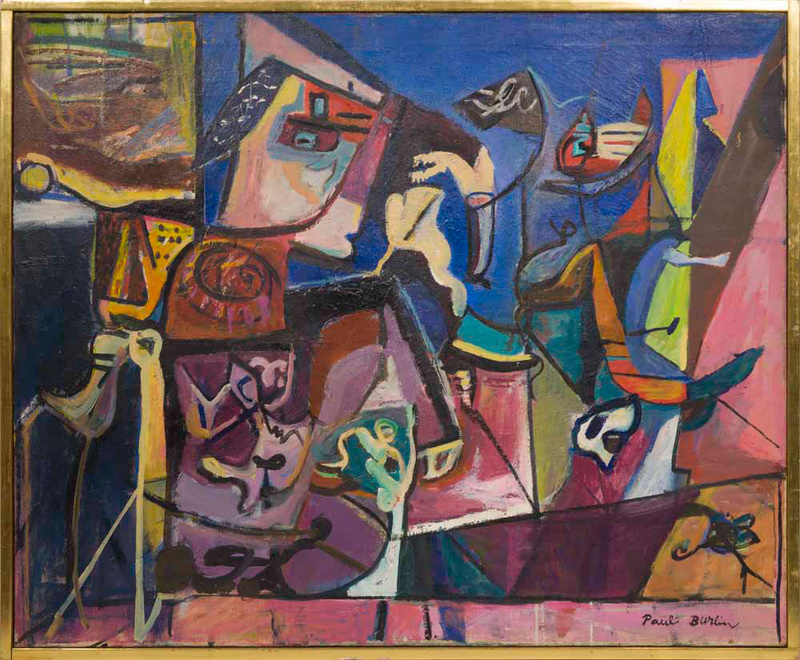 The ephemera he discovered—including a charred violin, sketches and extensive writings—will appear alongside artwork by Morang and other New Mexico modernists of the period in our December 12-26 exhibition MORANG & FRIENDS. As the show approaches we’ll tell the story of Parker’s treasure hunt, and recount colorful chapters from the life of Alfred Morang. Make sure to subscribe to our blog, and connect with us on Facebook, Twitter and Instagram for additional updates on this exciting project. Seats are filling up for our free COLLECTOR’S FORUM workshops, which begin next Friday as part of the Santa Fe Gallery Association’s Art Matters lecture series. The events have already given us the opportunity to connect with art lovers of all stripes. As the news spreads from person to person, a network is forming with links to local art legends like Alfred Morang and Fremont Ellis. That’s why this lovely friendship map of Parisian modern artists and patrons from the early 20th century caught our eye on Twitter the other day. Celebrated salonniere Gertrude Stein is the spider at the center of the web, of course, with Pablo Picasso and Henri Matisse and Joseph Stella and Henri-Pierre Roche entangled around her. Mabel Dodge and Marsden Hartley appear too, and their later New Mexico adventures tie this famous circle directly to our own rich cultural history. Forget six degrees of separation, we’re down to one! The workshops will feature fascinating behind-the-scenes stories from our gallery, and tales of tricky art conservation projects from special guest Matt Horowitz. Shoot us an email to reserve your seat and become a link in the long chain of art connoisseurs, from the City of Light to the City Different! Learn more about COLLECTOR’S FORUM on our exhibition page, and connect with us on Facebook and Twitter for daily gallery news.